In March 2012, Greece (the Hellenic Republic) was declared to be in default on its sovereign bonds by the International Swaps and Derivatives Association (ISDA) as a result of the invocation of Contingency Action Clauses (CAC’s). The following are the highlights from the ISDA press release announcing the default. LONDON, March 9, 2012 – The International Swaps and Derivatives Association, Inc. (ISDA) today announced that its EMEA Credit Derivatives Determinations Committee resolved unanimously that a Restructuring Credit Event has occurred with respect to The Hellenic Republic (Greece). The EMEA DC resolved that a Restructuring Credit Event has occurred under Section 4.7(a) of the ISDA 2003 Credit Derivatives Definitions (as amended by the July 2009 Supplement) following the exercise by The Hellenic Republic of collective action clauses to amend the terms of Greek law governed bonds issued by The Hellenic Republic such that the right of all holders of the Affected Bonds to receive payments has been reduced. The Committee determined that an auction will be held in respect of outstanding Credit Default Swaps (CDS) transactions on March 19. ISDA has published a list of obligations issued or guaranteed by The Hellenic Republic, which the EMEA Determinations Committee is currently in the process of reviewing. As with several EZ countries that suffered inordinately as a result of the 2008 financial crisis, Greece had taken advantage of low interest rates and the perception of being a low risk sovereign during the period following the adoption of the euro currency up until the 2008 crisis. The access to cheap credit helped to encourage asset speculation (especially in real estate) which came unstuck when global asset prices dropped dramatically in 2008/9. 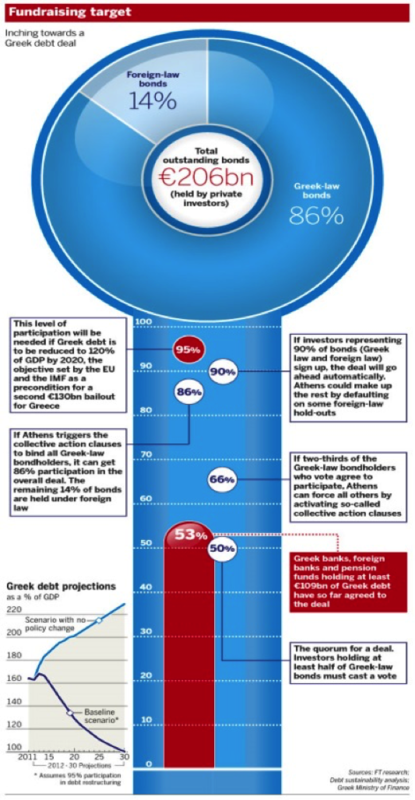 The Greek government was ineffective in managing the public deficits and encouraged by its ability to issue its debt in the single currency failed to recognize the real risk that was implied in the mounting debt/GDP ratio which is evidenced in the graphic below. The European Commission was negligent in not applying pressure on the Greek government to uphold the required restraint, as required by the Maastricht Treaty, regarding its annual deficits as a percentage of GDP. According to the treaty the ratio of the annual public deficit to GDP must not exceed 3% at the end of the preceding fiscal year. There was also a requirement that total debt to GDP should not exceed 60%. It should be pointed out that Greece was not the only EZ state to violate both of these requirements. It has been revealed that the Greek government obtained advice from US investment banks as to ways in which to obscure the levels of debt (through various off balance sheet devices) that it had at the time that it was seeking entry into the European Monetary Union (EMU). It has subsequently been claimed by some within the European Commission that had the true nature of Greece’s finances been revealed it would not have been permitted to join the EMU. In February 2010, the Greek government revised its 2009 public deficit from a previously estimated 5% to 12.7% of GDP. In April 2010, the reported 2009 deficit was further increased to 13.6% and at the time of the final revised calculation it ended at 15.6% of GDP. This was the highest deficit for any EU country in 2009. 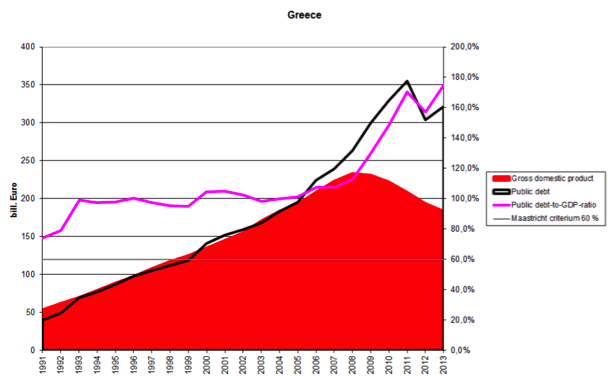 Total Greek government debt at the end of 2009, was also increased to revised €299.7 billion (130% GDP). This major upward revision of the deficit and debt level, was caused by flawed estimates and statistics previously being reported by the Greek authorities in 2009, resulting in the need for the statistics agency of the European Union, Eurostat, to perform an in depth financial audit. Despite widespread concerns within the global capital markets about the deteriorating credit-worthiness of the Greek state, a government bond auction which was held in January 2010 for €8bn of five year bonds was over-subscribed by four times. However the auction was attractively priced with a yield on issue of more than 6%; in contrast to the 2.3% yield at the time for German five year bonds this represented an almost 400 basis points spread against the most secure of Eurozone government issues. The growing sense of crisis during the first few months of 2010 and the realization that it would not be sustainable for the Greek government to continue pay such large coupons on its mounting debt contributed to a mounting sense that the EZ crisis had wide reaching and possibly systemic implications. The three major credit rating agencies (CRA’s) downgraded the Greek economy to junk status in April 2010 which caused private capital markets to freeze and the sovereign unable to continue funding itself. Eventually this lead to the first of several rescues by the Troika which consisted of the European Commission (EC), the European Central Bank (ECB) and the International Monetary Fund (IMF). From a systemic risk perspective it was also of great concern to the Troika that during 2011 it was estimated that approximately 70% of Greek government bonds were held by foreign investors - primarily commercial banks and where the substantial exposure of large German and French banks was particularly troublesome. This fact also helps to explain the linkage between sovereign risk and systemic risk since there is a vicious feedback loop between credit concerns arising in the public sector spilling over into the private sector banking system. Given that many of the largest banks are effectively Too Big To Fail – or at least that is the stance that has been largely taken by central banks and governments – then as the deterioration in public finances causes the sovereign risks to become more acute there is the real possibility that those same sovereigns (and neighbouring sovereigns) will become involved in further contagion as they have to come to the rescue of their domestic banking system which are suffering large losses on their holdings of sovereign debt. The downward spiral nature of this linkage is once again characteristic of the frightening dynamics of a systemic crisis. In addition to the financial risks there are also very severe consequences afflicted on the people who are victims of massive cuts in public services, the loss of jobs and homes and these can lead to civil unrest as shown in the two images below. When bonds are issued the terms and conditions of issuance will often include a Contingency Action Clause or CAC. Essentially this clause provides the issuer the right to re-structure the terms of a bond offering for all holders of the bond if a specified percentage of the bond-holders consent to such a re-structuring. The precise percentage can vary but it is usually in the region of 75%. The CAC provision became one of the most interesting features in the Greek default. The table above shows that prior to default the Greek government had about 90% of its outstanding debt issued under local law and about 10% issued under foreign and mainly English law. The English law bonds included a CAC but this was restricted to the actual bond itself. In other words for each of the separate issues or tranches that were issued under English law, the Greek government would need to get the required consent from the bond holders and if it obtained that it could only re-structure that particular issue. The English-law bonds issued or guaranteed by the Greek government included CACs on initial issuance. The threshold to activate the CACs introduced into the Greek-law bonds retroactively was based on an aggregate overall acceptance rate of 66%. From the point of view of the bondholders the more favourable protection provided by the English law bonds can be seen in the diagram below. 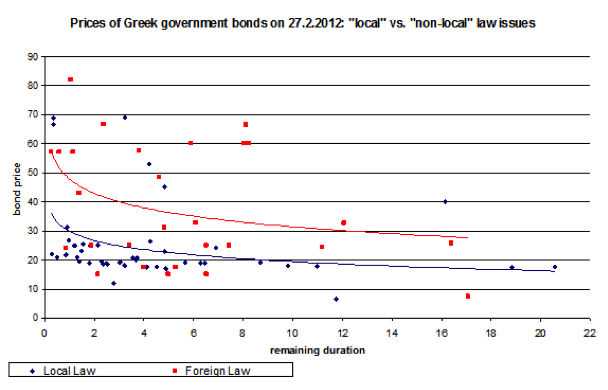 The prices of the bonds issued under Greek law, as of late February 2012 and just before the default, are plotted with red boxes whereas those issued under foreign law (which apart from a couple of exceptions meant English law) are depicted by the blue diamonds. Across the maturity spectrum – the horizontal axis – it can be seen that the English law bonds were trading at consistently higher prices than the Greek law bonds reflecting the fact that the holders of the latter had far better protections from a coercive exercise of an across the board re-structuring. Eventually the Greek government was able to obtain an exchange of the existing bonds for new issues with more attractive characteristics (from the point of view of the Greek government and the Troika) because of the retroactive introduction of CAC’s into the local law bonds. In February 2012, the Greek government launched an offer to exchange €206 bn. of bonds for new bonds with a face value of about €100 bn. While the terms of the exchange offer were substantially identical for bondholders under both Greek law and English law, the participation rate was considerably higher among holders of Greek-law bonds than among holders of foreign-law bonds. Creditors who opted not to participate in the exchange offer could more easily block a restructuring of an individual English law bond than of the Greek-law bonds as a whole. Indeed, for holders of Greek law bonds, one of the attractions of the exchange was that the new bonds would be governed by English law. The Greek government facilitated the re-structuring of all of the outstanding Greek-law bonds by passing new legislation in February 2012 that introduced collective action clauses (CACs) into Greek-law bonds that did not originally include such clauses. The clauses allowed the government to change, for all of those issued under Greek law, the bonds' terms if two thirds of the bondholders participating in the exchange agreed. In the event, bondholders representing about 85% of the outstanding amount accepted the exchange, and their decision to participate in the exchange offer then permitted its terms to become binding on all holders of Greek-law bonds. Although the trigger for whether a credit event had occurred and, in turn, whether there should be a pay-off under the CDS contracts has to be decided by the ISDA, the credit ratings agencies had already reached their own decision that Greece had defaulted. The following is the announcement by S&P to that effect. Feb 10, 2012 - Standard & Poor's Ratings Services said today that under its ratings criteria, application of retroactive "Collective Action Clauses" (CACs) affecting the timing or amount of debt service payments on outstanding Greek-law governed sovereign debt would constitute a selective default. Were such CACs implemented, Standard Poor's would lower the sovereign credit rating (the issuer credit rating) on Greece to 'SD'. We will also likely view any restructuring of Greek government debt as "distressed", meaning that we would consider the restructuring as likely materially changing, to the detriment of investors, the size and/or profile of Greece's sovereign debt burden as a result of its financial distress. Accordingly, it is our view that the terms of any Greek debt restructuring, including the retroactive application of CACs to Greece's sovereign issuances will likely offer less value to debt holders than was promised by the terms of the original issues. Under our criteria, this consequence would then prompt the rating actions described above. The default did not lead to massive payments by CDS protection sellers. According to the body which monitors outstanding CDS exposures, the Depository Trust & Clearing Corporation’s (DTCC) in the US, the total net exposure of market participants who had sold CDS credit protection on Greek sovereign debt was approximately $3.7bn as of late 2011. Figures above the maximum aggregate amount payable by CDS protection sellers would have been approximately 70% of $3.7bn or $2.6bn. On average, 70 per cent of derivatives exposure was initially collateralised and eventually the level of CDS collateralization was even higher at around 90%.Of $2.6bn payable, about $2.35 bn. had effectively been paid prior to the actual declaration of a default event. Foreign-law bonds with a face value of €6 billion did not participate in the exchange. In May 2012 the Greek government opted to repay in full €435 million of maturing English-law bonds. In July 2013, Greece paid in full a privately-held 2.125% bond of €540 million in Swiss Francs which was issued under foreign law. Norway’s sovereign-wealth fund rejected the Greek debt swap because it disagreed with the different treatment given to the European Central Bank, according to chief executive officer Yngve Slyngstad. Clive Corcoran is the course facilitator for PLUS Specialty Training’s Banking, Insurance and Financial Services including Foreign Exchange, Money Markets and Derivatives, Basel III Risk Assessment and Stress Testing and Mastering the Essentials of the Global Financial Industry. Clive Corcoran has been engaged in the finance and investment management sectors, on both sides of the Atlantic, for more than 25 years. After completing his education in the UK, Canada and the US, he co-founded and became the CEO of an asset management company based in the USA during the 1980’s and 90’s. The company provided wealth management and fiduciary services to a variety of international clients. His own responsibilities included personalized business management, international tax planning and providing strategic financial advice to high net worth individuals. Since re-locating to the UK in 2000, he has continued, as an FCA registered investment adviser, to be engaged in providing strategic investment advice to private clients and pension funds. During recent years he has written several books on international finance, focusing on asset allocation and risk management. He also has also been very actively involved in executive education on a global basis for finance professionals. He conducts workshops and in house courses on a variety of topics including risk management, Basel III and capital adequacy, central banking, systemic risk, asset allocation techniques, credit risk, market risk and derivatives. Some of the clients for whom he has provided in house training include the European Central Bank in Frankfurt, a central bank in the Eurozone, the European Commission, the largest bank in Russia, one of China’s G-SIB banks, two central banks in Africa, a sovereign wealth fund in the Gulf, China’s largest asset management company in Beijing, commercial banks in sub-Saharan Africa, a global banking group domiciled in the Netherlands, a central bank in South America, a public/private partnership in project finance based in Washington D.C., a major European clearing organization, the European Investment Bank (EIB), Goldman Sachs Asset Management and Oxford University Endowment Management.